Happy Thanksgiving to you! I'm glad to see other people let their big dogs inside the house too! Good to hear that your dogs LIVE inside. Our 3 little AND 3 big dogs live in our house too. We do let the big dogs sleep in the laundry room at night with a doggie door so they can take potty breaks in the night. Otherwise, they are all inside and I vacuum a lot! Happy Thanksgiving and Happy One Year!! I cannot believe it has been a year already. And a very enjoyable one. 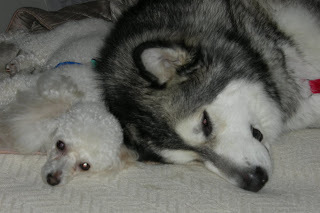 Sitka, please someday share a story with us about your poodle friend!! We love you! xoxoxo Toby, Ginger & Jeter (as dictated to their Mom, Ina) PS she said she really likes that carpet you and Nanuq are sitting on. So pretty! Our little one's sleep with us too! Sometimes our old dog Henry sleeps on a blanket in our room. Our big girls are too active at night for that. "One Year Blog Anniversary" wow congrats ~!! Happy thanksgiving, and a very happy blogaversary. Happy Anniversary, Sitka! I've enjoyed sharing this furry adventure with you! You've touched so many, Happy Blogoversary! Happy blogoversary my furry friend. The blogosphere is a better place because of you. I hope you had a wonderful Thanksgiving! Joyful blogiversary wishes to you and your mom! You're both dear and wonderful souls, and the blogging world is better because you're here!